In the last few years, everybody's become a hacker. No, most folks are not busting into computers and stealing state secrets. They’re up to something even more sinister -- persuading you to take an everyday substance (say, toothpaste) you’ve used successfully for years (brushing teeth) and try to shine up your heirloom sterling with the stuff. (Fail! Toothpaste is too abrasive for this task, unlike … wait for it … silver polish.) However, we have to admit some of these tricks actually work, making home maintenance a little simpler and a lot more fun. Read how we rate 8 household hacks. 1. Put a brick in your toilet tank to save water when you flush. Although this old hippie trick does technically reduce the amount of water used to flush the toilet, you’ll be running a major risk of scraping the heck out of the tank and its innards. And with mandatory low-flow in all new toilet installation since 1992, you will also face the risk of not leaving enough water to flush at all. 2. White vinegar is an excellent natural cleaner for your countertops. 3. Wrapping your showerhead in a vinegar-soaked cloth overnight removes limescale. Yes indeedy, this one does work. 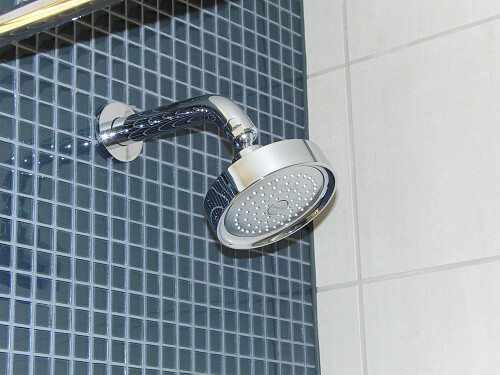 You will be pleasantly surprised at your newly clean and freer-flowing showerhead when you get up the next morning. Best of all, you’ll get fantastic results without scrubbing, scraping, or using toxic chemicals in the confined space of your bathroom. 4. An empty toilet paper tube can be repurposed as a handy-dandy vacuum cleaner attachment. Want to clean out all those cracks and crannies your vacuum cleaner crevice tool is not quite flexible enough to reach? Hold an empty cardboard TP tube over the end of your vacuum cleaner nozzle (I cheated by adding a rubber band); then squish it to fit small spaces like the tracks of your sliding door. 5. Canned air is great for getting dust and dirt out of your bathroom exhaust fan. I was very excited by this hack and got all set to try it on my own bathroom fan. However, upon reading the instructions on the canister (and double-checking them on the Net), I saw strong warnings never to “tilt, shake, or turn the can upside down” -- which, in order to spray a ceiling vent, I would obviously have to do. Of course, I could take the vent cover off (if I ever figure out how) but by that point, wiping with a good ol’ damp rag would be the line of least resistance. 6. Simplify degreasing oven racks; just soak in hot water with a dryer sheet added. Here's one I really, really wanted to come true. However, it turns out no matter how many times you repeat the soaking process, the racks always emerge from the water just as determinedly greasy and gunky as when they want in. The same thing happens if you try this to clean crusty baking pans. Sigh! 7. Sprinkling your home with peppermint essential oil will get rid of mice. This is one of those highly-touted household hacks that just. Does. Not. Help. At. All. (It will, however, leave your mouse-infested house smelling awfully nice.) Blocking the mice's entry points and hiring a pest control expert for serious infestation is usually the best solution. 8. A squeegee is a great tool for picking up pet hair from the carpet. The squeegee blade gathers up dog and cat hair nice and easily. In fact, it works equally well getting shed fur up off your sofa. I collected enough to stuff a lovely throw pillow. Good girl, Jackie!